Bradford’s proudest moment happened near the end of 1970. It wasn’t in any way Big Ape related, but in fact related to him. His great-grandson was born. Me. My earliest memories of great-grandpa are of me sitting on his lap in his screening room in Jacobs’ Landing, watching some of the early Big Ape films. Great-grandpa would bounce me on his knee and make some of the trademark Big Ape grunts and growls just for me. I loved it. I had all manner of Big Ape toys, Big Ape baby food, and live Big Ape performances on my birthday. I have an entire photo album dedicated to me and The Big Ape. The films continued, and continued, and continued, but it was the nightly news that brought some of the era’s best Big Ape material. President Nixon authorized the Watergate break-in, and when security cameras showed the thieves wearing Big Ape masks, then the next film practically wrote itself: The Big Ape Meets Nixon. A tense political thriller, it is still required viewing at all college film classes. Bradford had some of his rare missteps in the 1970’s. He opened a chain of Uncle Wu’s Big Ape Vietnamese Restaurants during the height of the Tet offensive. Jacobs Colossal Studios also began to produce a series of Great Ape films. The theory was if one giant ape is good, two giant apes are better. Bradford sold a whole slew of Great Ape products, but The Big Ape invariably sold better. The Great Ape today is just a footnote in Big Ape history. Bradco Confectionary Industries, Bradford’s candy making division, was forced to recall thousands of pounds of Big Ape Vanilla Paw Paws after it was discovered that the soft chewy candy was contaminated with spider eggs. Bradford was forced to close his Tijuana factory when an investigation showed that the entire building was contaminated with spiders. True to form, Bradford tried to make a movie out of this, but the guy in the suit flat-out refused. No way was I going in there! Those spiders were everywhere! They were crawling all over the suit, in the fur, in the boots, no way was I going to put it on. I learned my lesson back in 1965 when the suit became full of tadpoles when we made The Big Ape Comes to Frogtown. It was gross! I’d played The Big Ape in over a hundred films, but that was the worst. I once heard about the guy who wore the suit in The Big Ape Follies of 1939. He fell into a vat of caramel and died. No way was I going to die for this. I loved acting, but those spiders were over the line. Despite a few setbacks, Bradford continued to produce Big Ape films, foods, toys, and medicine right up to his death in 1986. The effect of Bradford B. Jacobs and his creation on society cannot be overemphasized. To understand The Big Ape is understand America. To know Bradford B. Jacobs is to know ourselves. No true account of America in the Twentieth Century can be complete without a thorough, in-depth study of those American icons, for as America went, so went The Big Ape. As The United States grew, so too did Bradford B. Jacobs. Usually, Bradford did not follow the trends of his country, he set them. The Big Ape did not merely reflect American culture and values, he was American culture and values. Oh, it is easy to dismiss The Big Ape as a man in a suit. Indeed, he was more. He was an astronaut at the height of the Space Race. He was a G.I. at Iwo Jima during WWII. He was a family man when the American family was under attack. He was all things to all people. When heroes were shown to have feet of clay, when Presidents were found to be mortal, when the populace was disillusioned and disheartened, they could look to the silver screen for all they were lacking. And in Bradford B. Jacobs himself, America had its leading citizen. Bradford B. Jacobs was bigger than the times. He transcended politics, economics, and social status. He was the true everyman, and if a man could be shown to be the true measure of an American , it was him. Not a man or woman can ever forget where they were when the tragic news of Bradford’s disappearance in a hot air balloon over the coast of Australia was broadcast. And though no body was recovered, the national day of mourning did little to settle the nation’s grief. Much like Elvis before him, sightings of Bradford B. Jacobs are reported around the world from time to time. And like true folk heroes, from Paul Bunyan to today’s greats, Bradford B. Jacobs has left a legacy that will not soon die. 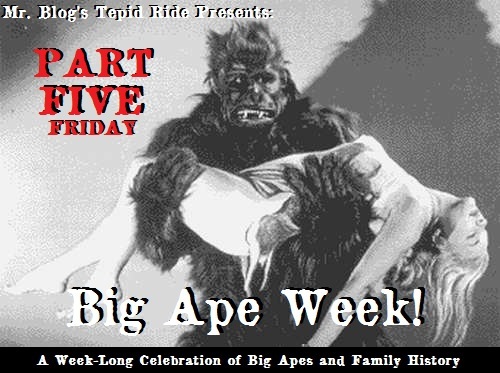 Come back tomorrow for the real, honest-to-God true story of me and the Big Ape. How have you retained such modesty in the face of such an illustrious family background?? It hasn’t been easy. I tend to be recognized in public since Great-Granadad appeared with me and the Ape on the cover of the The Big Book of Big Ape Baby Names when I was young. I think your next project should be some detective work to try to track down any of the surviving “exotic” films that Bradford made before he went ape! Just next to the ones labelled “Roswell” no doubt! Very true. Little known fact: Documents found under the Freedom of Information Act reveal that Bradford B. Jacobs bought a lot land around Roswell in June 1948, just days before the incident. For the last 18 years of his life he was frequent visitor at Area 51. That explains why my birth certificate was accompanied by a security clearance.